Winners of the 2014 Sustainability Innovator Awards pose with staff from the Office of Sustainability Initiatives. They include (left to right) Kelly Weisinger, Emily Cumbie-Drake, Leslie Hubble, Daniel Rochberg, Eri Saikawa, Peggy Barlett, Naomi Maisel, Ioulia Fenton and Ciannat Howett. Emory Photo/Video. From an academic learning community dedicated to Climate@Emory to a "Paved with Poetry" proposal to promote sustainability efforts, recent awards from the Office of Sustainability Initiatives honor people and projects that combine Emory's blue and gold to make green. Each year, the Sustainability Innovator Awards are presented to faculty, staff and students who have made a significant contribution to sustainability on campus, while Sustainability Incentives Fund grants are awarded to promising new projects. "The individuals and teams who have received these accolades are some of our initiatives' strongest partners and our work would be impossible without their support," says Emily Cumbie-Drake, sustainability program coordinator in the Office of Sustainability Initiatives. Recipients of this year's Incentives Fund grants were honored during a Nov. 3 luncheon. Overall, 14 projects will share a total of $15,000 in funding. "The Incentives Fund Selection Committee received over $40,000 in applications from students, faculty and staff from Emory University and Emory Healthcare, and it was a difficult deliberation process to pick this year's recipients., " Cumbie-Drake says. • White Hall "Walk Don't Ride" campaign (team leader: Andrea Lentz): Signs will be installed on elevator doors in White Hall to promote the use of stairs. • Educational signage for hydration stations (team leader: Roger Tieu): A project to install hydration station signage to promote use of reusable water bottles. Recipients of Sustainability Incentives Fund grants were honored Nov. 3. Emory Photo/Video. 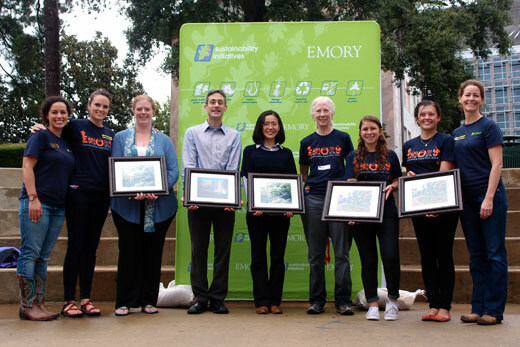 The 2014 Sustainability Innovator Awards were presented Oct. 3 during Emory's ninth annual Sustainable Food Fair. "The Sustainability Innovator Awards are our opportunity to recognize student, faculty, staff and health care leaders who have contributed extensive time and energy towards promoting sustainability initiatives at Emory," Cumbie-Drake says. "We hope they will inspire others to help make Emory a more sustainable community for all." Saikawa is an assistant professor of environmental sciences in Emory College and environmental health at Rollins School of Public Health; Rochberg is an instructor in environmental sciences in Emory College and environmental health at Rollins School of Public Health. This year at Emory, a group of faculty led by Saikawa and Rochberg developed the Climate@Emory academic learning community. Maisel is a junior in Emory College who has worked for nearly two years to launch Campus Kitchen Emory, a student group that collects, repurposes and donates unused food from Emory dining facilities and catered events. Her project has brought together partners from Volunteer Emory, Greek Life, Emory Dining, Sodexo, Office of Sustainability, local food banks, shelters and countless students. She is also the sustainability beat writer for the Emory Wheel. Fenton is a second year Ph.D. candidate in the Department of Anthropology and was honored for her multi-faceted contributions to sustainability during her first year at Emory and in particular for her role as president and founder of the Graduate Sustainability Group, the first such group in Laney Graduate School. She was a participant in the 2014 Piedmont TATOO, has written sustainability-focused articles for the Emory Wheel, and as a first year student taught a graduate-level course on sustainable development through the Masters in Development Practice program. Hubble is an environmental compliance officer in Emory's Environmental Health and Safety Office. This year, she was instrumental in the development of a Green Labs@Emory program that is designed to offer Emory's research and teaching laboratories a set of tools and incentives for integrating sustainability into their operations. She has helped recruit volunteer labs, develop a lab recycling protocol, and has also been a sustainability representative for her building for several years. Maloney is associate administrator of Emory University Hospital; Wimby is associate administrator of Emory University Hospital Midtown. As part of the University's Strategic Plan and Sustainability Vision, Emory and Emory Healthcare have committed to diverting 65 percent of Emory's waste away from landfills by 2015. Maloney and Wimby have been instrumental in leading a team of dedicated health care staff in environmental services, anesthesia, the operating rooms, and sterile processing to develop a program for diverting clean recyclable waste from the operating rooms and other clinical spaces.